January is National Glaucoma Awareness Month, and while many people have heard of glaucoma, most don’t fully understand the seriousness of the condition, or realize that it is the leading cause of vision loss and blindness in the United States for those over 60. Glaucoma is quite common in the United States, so understanding how to detect the condition in its early stages is key for preventing vision loss. Glaucoma is a condition that causes damage to the eye’s optic nerve and that gets worse over time. The condition is often caused by a buildup of pressure in the eye, referred to as intraocular pressure. 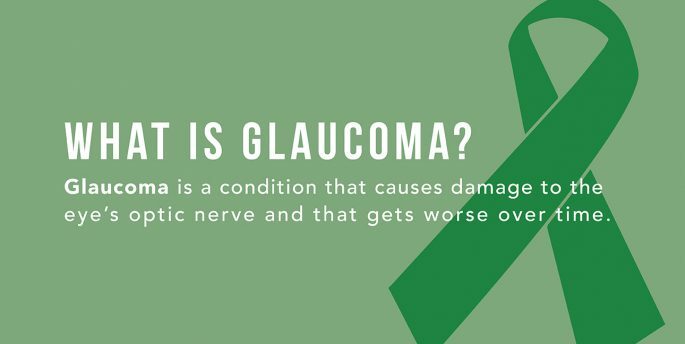 The optic nerve is vital for clear vision, as it is responsible for transmitting images to the brain, meaning if the damage continues, glaucoma can lead to permanent vision loss. If left totally untreated, permanent blindness is possible within a couple years. While less common, rapid onset glaucoma, caused by a sudden increase in pressure, has more noticeable symptoms, like blurred vision, severe eye pain, headache, rainbow-colored halos around lights, nausea and vomiting. This is an emergency, and if not treated immediately, could result in permanent blindness. Glaucoma is detected through comprehensive eye exams, so the importance of regular eye exams cannot be overlooked when it comes to protecting vision. While there is no cure for glaucoma, if you have been diagnosed with the condition, there are available treatments to control the disease and prevent further vision loss. Treatments include medicines, in the form of eye drops or pills, laser trabeculoplasty, or conventional surgery. Having ongoing conversations with your eye doctor about treatment, and keeping up with regular comprehensive eye exams, is the best course of action. With the new year comes new resolutions. This year, be sure to set aside time for annual comprehensive eye exams for you and your family members. Eye exams can detect a variety of different diseases in their early stages, including glaucoma. At Rx Optical, we are dedicated to helping you enjoy life and see clearly. Stop in, give us a call, or schedule your appointment online. We can’t wait to see you!